Le Cong Kieu street near Ben Thanh Market in the center of District 1 is better known as “Antique Street”. This is a place where history touches the modern world as genuine antiques and fakes sit side by side in 30 shops and on the sidewalks. The shops are filled with stones, wooden statues, bronze goods, porcelain that vary from tiny pots a mere centimeters high to coins, necklaces and large pieces like an obsolete fan or ancient furniture. Many shops sell plates, jugs, and pots fished out from ancient wrecks in Cham island. They could cost VND200,000-300,000. The prices of some items are not displayed. Many of the shopowners are professional collectors and often arrogant -- they offer fixed prices and do not bother to call back customers who leave if they don’t like the prices. Other owners appraise the customer’s financial ability before quoting prices. Thus, those without a thorough understanding of antiques are likely to pay a price. Buyers must know how to distinguish between genuine and fake antiques, professional collectors warn, since the former are becoming rarer here. There are also the shopkeepers who frankly say which items are fake. Some are deliberately ambiguous, claming their goods are “old”. But bargains with professional collectors and dealers are likely to finish quickly. A shopowner said that the knowledge pertaining to finding, assessing, and trading antiques are usually passed on from father to son, and that each family has its own secret methods to date and value items. “Getting involved in this job entails traveling all over the country to find items,” he said. Many shop owners hail from the north. One of them said there are also rules between professional collectors that customers cannot be offered everything unless they have a close relationship with the shop owners. Each shop owner runs their own network to hunt antique items. They have dealers specializing in buying and collecting antique things. Once the dealers find one, they will call their boss. Mr. Son, a young shop owner, said collectors can order the shops to buy items that are still missing in their collection. Of course, their prices will be higher than the ones available at the shops. By patiently hunting antiques, sometimes shop owners can buy a rare precious item at a very cheap price. Shop-owners said collectors are prefer antiques than porcelain items, many ask for ancient wooden things. Nostalgic “rich people” order salient beds, wardrobes, furniture made from ebony, rosewood, kingwood tattooed skillfully, whose cheapest price is more than millions of Viet Nam dongs per item. Here there is a club of pavement collectors. In the morning, they gather on the street’s sidewalks to have coffee talking about antique market. Maybe, there is nowhere else the information about antiques spreads as quickly as here because pavement antique collectors also have a large amount of original antiques, most of which they luckily hunted here. 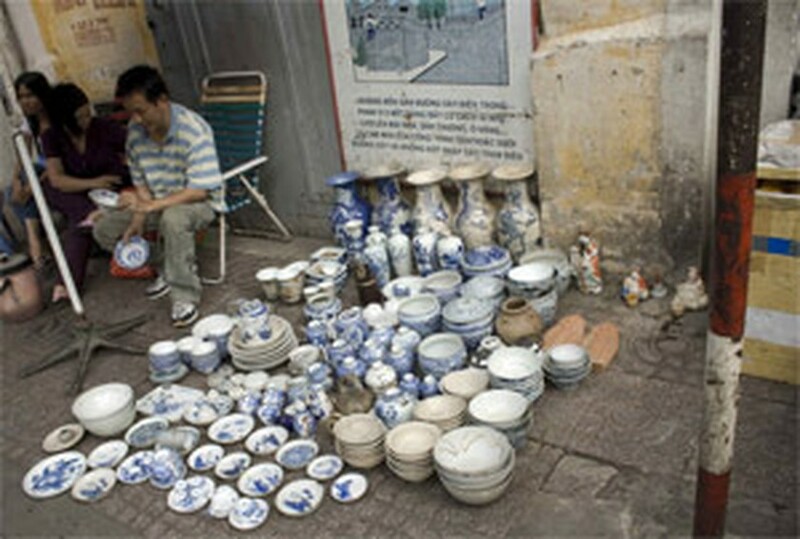 The antique street is attractive to not only antique collectors in HCMC but also rich ones from Northern and traders from China, Cambodia, and Thailand. Taking a walk around the antique street, we have a feeling as if we lived in the ancient past time because everything here is obviously obsolete, mysterious and clearly marked by time.